We deep clean and restore floors to their original condition. They'll look like-new! We use IICRC certified technicians and the best technology to restore carpet. We use the LoMAC low moisture system — which has earned the seal of approval from the Carpet and Rug Institute — and extends the life of your carpet. Our Truck Mount steam cleaning system is perfect for deep cleaning carpet and remedies spots, stains and smells. We can restore your wood floors to their like-new condition without sanding. Our experience with wood floor restoration includes very large wood floors like hardwood courts. We get courts to have their original luster through our Gym Finish process. We set the gold standard for stone restoration through our “Natural Grind” system which revitalizes floors to their new condition. We restore concrete floors that have been painted or are showing heavy usage back to their original condition. Our process includes removing unwanted paint, refinishing the surface and finally, polishing it. We know floors intimately. That means that we use the best products, equipment and unique techniques to get the best results from each type of floor. It's likely that we can restore your floor to its original condition so that you don't have to replace it — saving you time, money and anguish. Learn how we rescued badly damaged floors from our Clients. 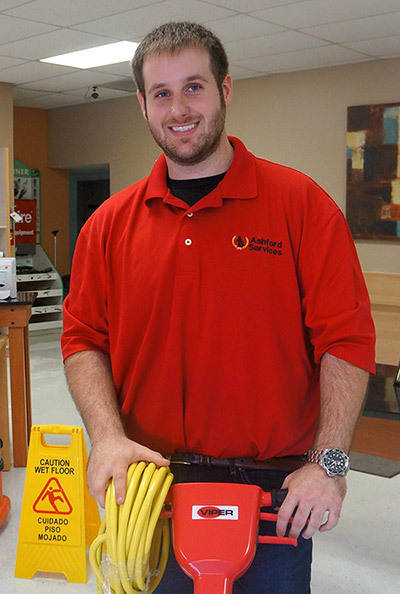 We offer custom maintenance programs to fit the traffic needs of your floors. Our maintenance programs maximize the longevity of your floors and are competitively priced. Reduce Maintenance Costs - since 80% of the dirt in your building is tracked in through the front door, you can reduce the maintenance costs associated with your floors by using mats. Provide Safety - mats keep floors clean, dry and more slip resistant than hard floors. Extend Comfort - mats serve as a static dissipative in sensitive areas and as an anti-fatigue agent where standing work is done, thus extending comfort to those who stand on them. Brand Your Business - using custom logo mats is an opportunity to further brand your business. "The team was great!" — A-Jax Company Inc.
Talk to a Real Person When You Call. We do our best to pick up the phone within 2 rings. "Absolutely the BEST floor service we've ever had. It looks beautiful! Thank you." © 2019 by Ashford Services. Website by Bodigiti.